In moonlight, Chef Bela’s Gastronomy Pod looks like a giant silver snail, sliming up Crabtree Park. 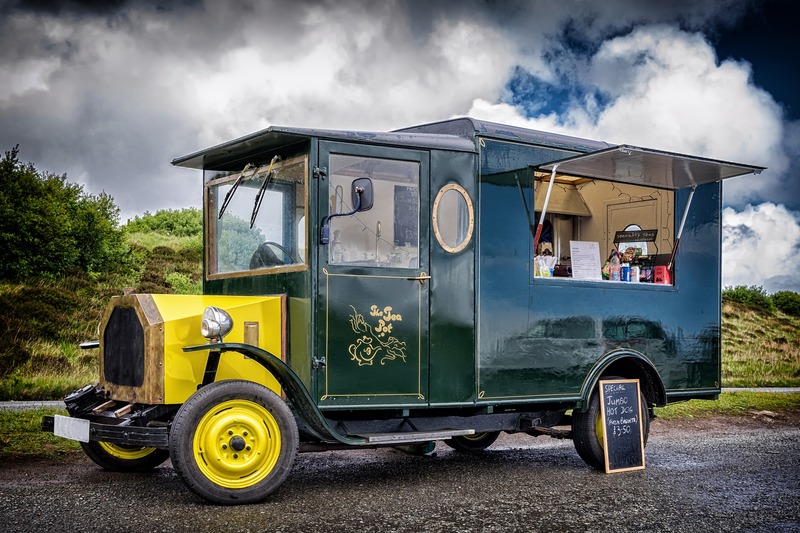 Vincent Pankhurst sneers at the chrome striping, the hand-chalked menu, and especially the inelegant student-artist caricature of the food van’s owner. The gap-toothed cartoon Chef Bela grins down at him, blithely ignoring Vince’s seething disdain. Vince’s companion, who gave his name as “Scotty” but probably lied, doesn’t know who Chef Bela is and doesn’t care as long as the pay’s good. When they arrived in Scotty’s battered ute, Vince tried to explain about his reviews. Scotty ignored him and rummaged through his car boot, shoving aside boots, gloves, fuel cans and spare tyres until he found a dented toolbox sealed with a heavy padlock. He unlocked it with a key chained around his scarred and tattooed neck. Scotty’s attention is fixed on his job. He works two pry bars, thin as flattened needles, into the keyhole of the food van’s door. His tongue sticks out. He’s humming something too off-key to identify. He sounds absurdly happy. Vince fumes while Scotty picks the lock. It shouldn’t have come to this. Chef Bela should have come to the party. The Feast Hunter is the biggest restaurant review stream in the city. In the state, probably. Two high-def episodes a week of the best food and the freshest snark, served up sharp and spicy to thousands of hungry followers. It’s a show with the power to make or break new eateries, and every hipster cafe from here to the coast knows it. Vince’s popularity means he can ask for whatever he wants. Free meals. Complimentary drinks. His pick of tables. When his camera’s running – and it runs live and unbroken for over an hour most shows – nobody turns down the chance to make a good impression with The Feast Hunter’s audience. “How’d you hear about me, anyway?” Scotty asks suddenly. Word of the hot new food van reached Vince’s inbox before the van’s mural was dry. He sniffed out the details: Bela Fazekas, age 22, wunderkind graduate of celebrity chef Numa Domme’s Cuisine Academy, turned his back on stardom in the first-class kitchens of Europe and America for a self-starter gastronomic popup in the inner suburbs. On Vince’s turf. In Vince’s house. He reached out via email with his usual offer: in return for first week access and his choice from the menu offered up with the chef’s compliments, Vince guaranteed a positive post-meal interview and a minimum of four smacked lips on the Feast Hunter scale. Vince scrambled to deploy his revenge. After briefly scanning the online menu, he recorded a forty minute video, castigating the arrogant upstart’s mediocre techniques, his uninspired flavours and his unbelievably stupid little van. He was, in all modesty, at his caustic best. He poured scorn like scalding bone broth and dropped truths harsh enough to leave a scar. He wasn’t just magnificent. He was potentially viral. Before he could upload his scathing blast like a knife to Chef Bela’s future prospects, the first reviews appeared online. The reviewers heaped praise on the Gastronomy Pod like nuts on a sundae. Ten, then twenty, then three dozen in under an hour. Five stars across the board. How? Chef Bela had decided to open his van a day early, and invited local dignitaries, business people and members of the press to a special preview sitting. The Feast Hunter was not asked to participate. The rant was worthless before it had even posted. With figures like those, accompanied by plaudits too detailed to be plausibly fake, nobody would believe Vince had sampled Chef Bela’s menu and come to a different conclusion. The insult was intentional. Vince could smell it. The only valid response was to burn him back. Vince flashes his trademark smirk. “Nothing at all. I’m leaving something.” He holds up two ziplock sandwich bags. The first packet bulges with small, brown objects. The second’s contents are larger, furry and with a curving tail. The door slams shut and locks. He’s answered with a banging noise from Scotty’s car, then splashes, and a long slow hissing noise. I decided it’s been too long since the last Dumb Crime story, which was probably The Ninja Fireys’ Big Score, unless I’m forgetting one. This entry was posted in Friday flash fiction and tagged arson, celebrity, crime, dumb crime, flash fiction, food, Friday flash, social media, stay out of the kitchen. Bookmark the permalink.